Calgary, Canada—Today, Blackline Safety Corp. (TSX Venture: BLN) announces that Cermaq Canada has purchased Loner® Bridge Systems from Blackline Safety to monitor the wellbeing of its fishery personnel. With 250 employees working on British Columbia’s coast, Cermaq Canada farms salmon in the waters around Vancouver Island. The Loner Bridge System consists of two parts, a portable satellite base station and a person-worn monitoring device. The Loner Bridge base station remains out in the open and receives Iridium® satellite signals, broadcasting this data connection to the employee’s Loner 900 lone worker monitoring device. Employees are able to confidently work everywhere at the fishery, knowing their safety is being monitored—even inside buildings. The Loner Bridge device features TeamAlert that initiates site-wide evacuations. Blackline’s 24/7 in-house Safety Operations Center provides live monitoring and can trigger an evacuation by initiating a TeamAlert on one or more Loner Bridge devices. Employee-worn Loner 900 devices incorporate an audible and visual alarm that instructs each fishery worker to muster at the Loner Bridge device. Fishery personnel then communicate with monitoring personnel via text message for important information and instructions. Both devices incorporate GPS positioning technology that enables monitoring personnel to map employees’ exact locations to quickly deliver the needed help. In addition to triggering evacuations, Loner 900 detects falls, includes a motionless / man-down alarm and features automated employee check-in capability. A lone worker can call for help manually using a convenient emergency latch that can be triggered even if an employee’s vision is compromised. Loner 900 is also compatible with Blackline’s Loner Beacon indoor location technology for use where GPS signals are unreliable or unavailable. Blackline's broad safety monitoring portfolio empowers organizations in all industries and geographic locations with real-time safety incident awareness, delivering help within minutes instead of hours or potentially days later. To learn more about Blackline's work-alone safety monitoring solutions, visit www.BlacklineSafety.com and follow Blackline on Twitter @blacklinesafety. About Cermaq Canada: Cermaq Canada is a subsidiary of Cermaq Group AS, an international fish farming organization with head office in Oslo, Norway. 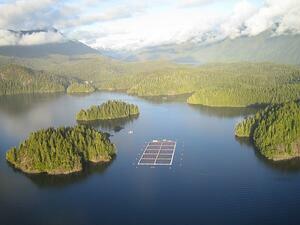 The group has a diversified presence in the major salmon farming regions worldwide. Creating values through sustainable aquaculture is the mission that underlies all of Cermaq's operations. Cermaq Group AS is a fully owned subsidiary of Mitsubishi Corporation. For more information, visit www.cermaq.com. About Blackline: Blackline Safety Corp. (TSX.V: BLN) is a wireless location leader that develops, manufactures, and markets products and services for lone worker safety monitoring. Targeting every industry, employee role and location, our Loner® solutions are promoted through offices in Calgary, Los Angeles and the United Kingdom, and sold through a growing network of international resellers. Loner products alert monitoring personnel of a safety incident, locate the employee and empower the most efficient emergency response—Alert. Locate. Respond.™ Our vision is to become the leading supplier of wirelessly connected lone worker safety monitoring products in the world. For more information, visit www.BlacklineSafety.com.